Our coaches offer personalized instruction for individuals and small groups. Whether you want to dial in your riding with one-on-one attention or learn in a small group, you will have dedicated, personalized instruction on the weekend you want. Our coaches bring a wealth of expertise, experience and enthusiasm to our clients. VIDA's coaches have worked with clients for a minimum of 3 years, many for longer. Add in an IMBA Level 1, 2, PMBI coaching certifications and professional racing experience, and you will be learning from the best. Our coaches know the trails in and out - it's their home trail system! 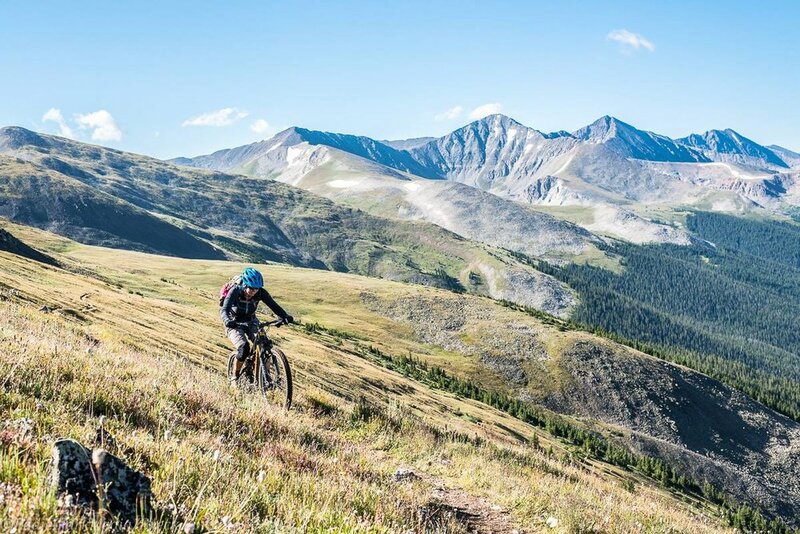 You'll spend your time in Summit County on trails tailored to fit your riding goals. Drops? We have them. Cornering? Yep! Technical climbing? You bet. Anne St. Claire, originally a Pennsylvania native, migrated west on a cross-country road cycling adventure–eventually landing in Breckenridge, Colorado in 2006. Her love of bike-touring and her first mountain bike ride in Moab launched her head over heels into a decade-long career as a mountain bike guide based out of Moab, UT. Having guided over 100 multi-day bike tours across the western U.S., Anne’s greatest joy has been sharing the ride experience and encouraging lifelong trail exploration. During the winter months, she teaches avalanche education for the Backcountry Babes and works as a lead backcountry ski guide and Snow Safety Director for Powder Addiction cat-skiing. Anne is excited beyond words to see women in the mountain bike industry making waves, and she is grateful for the opportunity to contribute through her involvement with VIDA. Most importantly, Anne is a Cancer, her spirit animal is a buffalo, and her favorite breakfast is huevos rancheros. Christian Little has been adventuring in the Colorado mountains for over 10 years and enjoys riding in Summit County with those stoked to experience it. She has lived, raced, adventured, and worked with athletes in various parts of the world, most recently New Zealand. She currently heads up Restore Performance and Leap2fly in her purpose-driven MTB entrepreneurial life. Previously a professor of physical therapy, Christian has her IMBA Level 1 MTB Coaching Certificate, Wilderness First Responders, CPR, and a Doctor of Physical Therapy. She has competed in Xterra off road triathlon Nationals and Worlds, MTB races throughout Colorado, and the Pioneer MTB Stage Race in New Zealand. She also pioneered a MTB route through the European Alps in honor of her friend's mom who had been diagnosed with cancer, shortly after Christian was recovering from a broken back and spinal cord injury. Through her journey of hardship she hopes to encourage and inspire those she guides on the trail to take in the beautiful experience and live life to the fullest. She is an adventurous soul who loves exploring this beautiful world on two wheels and sharing the experience with others. When Christian isn't biking you can probably find her backcountry skiing, surfing, adventuring in the outdoors with her dog Bashful.